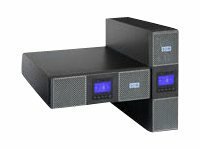 The Eaton 9PX UPS provides energy efficient power protection for small & medium Datacenters, IT rooms and Infrastructure. Delivering double conversion protection with 40% less energy usage and 28% more power 9PX is the perfect UPS for IT and Facility managers that are concerned by energy cost and are looking for next generation power protection solutions. Graphical LCD display It provides clear information on the UPS's status and measurements on a single screen which tilts 450 for ease-of-viewing. Availability and flexibility The internal bypass allows service continuity in case of internal fault, a maintenance bypass is also available for easy replacement of the UPS without powering down critical systems. Paralleling functionality Paralleling functionality to achieve twice the power of unitary products using Hot Sync technology! Load segment control It enables prioritized shut downs of nonessential equipment to maximize battery runtime for critical devices. 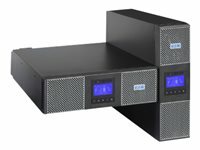 Description: The Eaton 9PX UPS provides energy efficient power protection for small & medium Datacenters, IT rooms and Infrastructure. Delivering double conversion protection with 40% less energy usage and 28% more power 9PX is the perfect UPS for IT and Facility managers that are concerned by energy cost and are looking for next generation power protection solutions. 180V Extended battery module for the Eaton 9PX. The Eaton 9PX UPS provides energy efficient power protection for small & medium Datacenters, IT rooms and Infrastructure. Delivering double conversion protection with 40% less energy usage and 28% more power 9PX is the perfect UPS for IT and Facility managers that are concerned by energy cost and are looking for next generation power protection solutions. Extended battery module for the Eaton 9PX. The Eaton 9PX UPS provides energy efficient power protection for small & medium Datacenters, IT rooms and Infrastructure. Delivering double conversion protection with 40% less energy usage and 28% more power 9PX is the perfect UPS for IT and Facility managers that are concerned by energy cost and are looking for next generation power protection solutions.